Ant Man fighting Ant Man fighting Ants! There is an Ant Man movie being made. I have to say that I’m exited. Because of the many roles Ant Man has played in Marvel comics there are so many different angles they can take with this. This is almost a problem. No matter which direction they take they might be leaving out someone’s favorite aspect. I want to rant a little about what I would do, but first a quick summation of the different Ant Men. 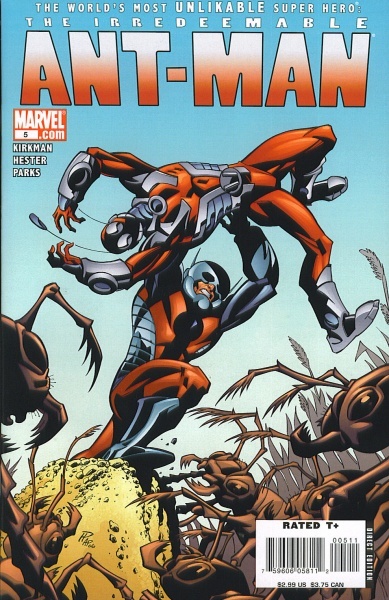 1) Hank Pym – The original. Founding member of the Avengers. Also, considered a little crazy. Hank Pym has had at least three different super hero identities (Ant Man, Giant Man, Yellowjacket) and at least one break with reality (when he convinced himself that Yellowjacket was a completely different person from Hank Pym.) He created Ultron, one of the main villains of the Avengers rogues gallery. Also, he once hit his then wife, Janet van Dyne aka the Wasp. This is important, not only because spouse abuse is obviously bad, but also because for years this has been to the go to story to write about Hank Pym when a writer doesn’t know what else to do. 2) Scott Lang – The Ant Man I know the least about. He was a criminal who stole the Ant Man suit. His inherit nobility took over and with the greater power came greater responsibility. I’ve heard arguments that he is the most typically heroic of the Ant Men, and even though I haven’t read as many comics featuring him, this seems accurate. Also, has a daughter that also was once a hero (she’s dead now). In comics he also died and came back. Just so you know. 3) Eric O’Grady – the irredeemable Ant Man. The idea was what if a the most weaselly agent of Shield got his hands on the Ant Man armor. He treaded that fine line as a guy who wanted to take the easiest path to everything and had the occasional inkling of heroics. I believe in the twelve issues of his self titled comic he most often used his powers to get out of work and peek on female Agents in the shower. By the by, he’s dead now. 4) Janet Van Dyne – not an Ant Man, but an essential element in his story. Also a founding member of the avengers. In the comics she has gone from being a ditzy heiress Girl Friday to a capable (but often fashion obsessed) stout leader of the Avengers. Once married to Hank Pym, got slapped and their relationship slowly fell apart. Now they are on good terms. She got her start in heroics, I believe, by approaching Pym to help save her father and ended up taking some of the experimental whathoosits he was working on. Science! She also either died, or perhaps was suspended in an alternate dimension. Whatever. Those are the main characters in the Ant Man comics world. So far Michael Douglas has been cast as Hank Pym. Paul Rudd has been cast as Ant Man (Rumor says it will be Lang but that is unconfirmed). Evangeline Lilly has been cast as someone. Its a mystery. Michael Douglas is a yet unseen top scientist in SHIELD. He has had some personal problems in the past, but has made amends and works hard to be the man he should be despite a dark mark in his record. He’s brilliant but maybe not completely trusted because of past overreaches, breakdowns. He’s too smart to let go, but maybe just unstable enough to want to keep in the front office. He is in the office that they would put a screw-up like Bruce Banner if Banner suddenly stopped Hulking out. Working with Douglas in some fashion, lab tech, prototype tester, is Paul Rudd. This is not a prime position. Take some of the O’Grady aspects and turn it down several notches. Rudd is very likable, but a bumbler. Not someone you think of as a hero at all, but certainly someone you’d want to hang out with. Lilly is Douglas’ daughter. They have a somewhat strained relationship due to his past. Maybe in one of his episodes he struck his wife/Lilly’s mother. Once. He has regretted it ever since. Lilly knows that do to his unstableness it wasn’t exactly his fault but can’t forgive. To me this is a huge tough spot. They need to keep Douglas likable and keep from tuning him into mustache twirling wife beater. Also, they need to make it clear that the movie isn’t condoning his actions, or saying something like “all crazies are dangerous!” Personally, I think touching on these issues would make the movie a much more difficult sell to an audience. 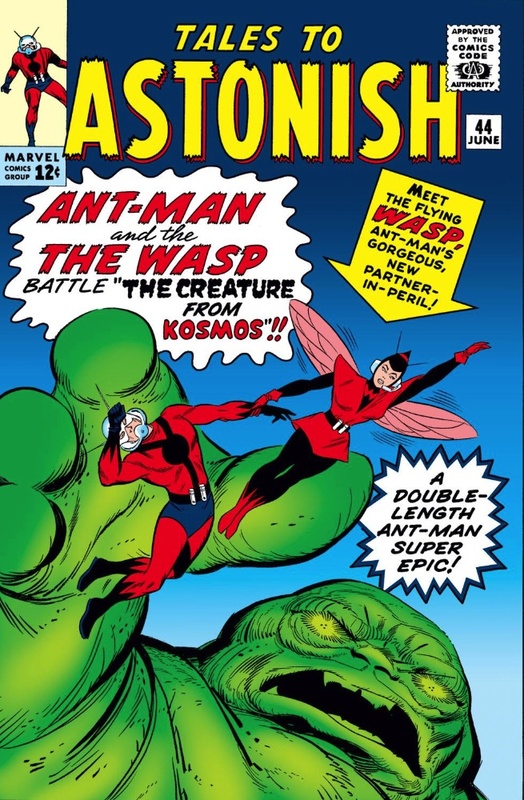 It might just be safer to say his Pym Particles, the thingies that let Ant Man shrink made him unstable for a bit. That the particles caused an explosion that killed his wife. He wasn’t directly responsible but still feels guilt and regret over his actions. That is probably easier for an audience to digest about a character in a 90-120 minute movie. An explosion can get us enough into character motivations and relationships without having to slip into the murky waters of abuse. Anyway, criminal organization Hydra/Centipede/AIM attacks. Lab goes kablooey! Rudd is in the suit and hides! Lilly is convenient in another part of lab, like the cafeteria. Bad guys get away with Douglas. Rudd wants to leave it to SHIELD. Lilly doesn’t want to wait around and she breaks out the Ant Man type II equipment. Together they go fight the bad guys. Lilly takes charge and inspires Rudd to find the hero within. Lilly rescues her father and there relationship starts to repair. For bonus points include Maria Hill from the other Marvel movies and have seems with her an Lilly as competent women being competent. Heck, work Lilly in as a SHIELD agent. Maybe she is involved in a program for lighter versions of Iron Man tech for agents. She gets dispatched to see what her father has developed. In fact why don’ they make her the POV character? Start the journey with her in a flight suit that isn’t working. Spend twenty minutes with her as a boots on the found agent. Use her character type to show that not all women of SHIELD have the stoic personalities of Black Widow and Melinda Mei. Show her both as being tough soldier and fun-loving fashion bug. Then she gets introduced into the weird tech/science world of Douglas and Rudd. Even in her first appearance Janet van Dyne took control! The Wasp is arguably the most iconic Marvel woman (outside the X-Men). Ant Man is an odd character. I like Pym, but I have to agree it is an odd movie to go ahead with. Unless they are using the movie to secretly make it about the Wasp. I’ve read that the powers that be don’t believe a female character to hold together a superhero movie. That that can’t merchandise enough if the title character is a lady not a guy. Maybe Marvel is giving them the title, but is going to ensure that the breakout character is Lilly’s the Wasp. How smart would that be? Marvel has been leading the charge of what to do with making a superhero movie. Now is their chance to show that leading superheroes on the silver screen don’t need to be limited to guys. That’s what I think they should do with Ant Man. Make it really about Janet Van Dyne aka The Wasp. Special Character by Action, Not by Backstory; Or: Why R2D2 shouldn’t be in the prequels. Maybe the whole “Electra” thing put them off having a female lead too. I agree with your take on this though, because Wasp is much cooler. Personally I’d like to see them do Spider-Woman, because I really enjoyed her in the New Avengers (at least what I read of it). I doubt that will happen though. Yeah, for whatever problems the Daredevil movie had, Electra was a further step down. Spider Woman would be crazy! Which backstory would they use! Now that I think about it she could be a great addition to Agents of SHIELD.